Little Bear loves the sunlight that shines in through his windows and considers it his very own special sunshine. But when it is time for him to hibernate for winter and he forgets to close his curtains, Little Bear tosses and turns until the arrival of an unusual visitor helps him to sleep soundly. 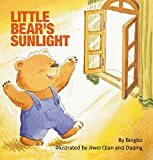 A beautifully illustrated and adorable tale of a little bear, hibernation, sunshine, and shadows by Bingbo, the multi-award-winning author of hundreds stories for children.